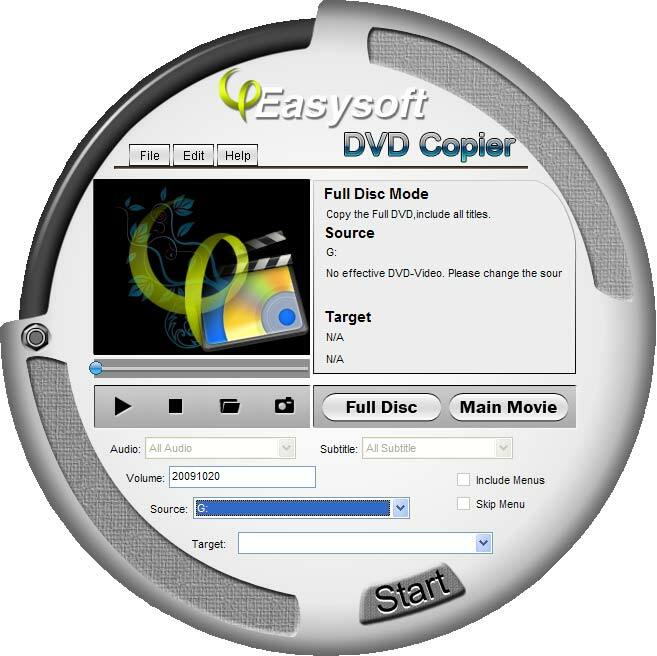 4Easysoft DVD Copier can also create DVD from your local DVD folders or ISO image files. More assistant functions are also provided for you to get the exact result. Choose to copy full disc or main movie of the source DVD, select target audio and subtitle, and include or skip menu to meet your specific need and edit the volume. This DVD movie copier can exactly copy DVD to DVD in 1:1 ratio or compress DVD-9 to DVD-5. With this DVD Copier software, you can backup DVD to DVD folders or ISO image files on your local disk. You can burn DVD from local DVD folders or ISO files. You can choose to copy the whole DVD disc with all the special features, intros, trailer and ads, or just copy the main movie. This DVD copier software is compatible with DVD+-R/RW, DVD-RAM, most DVD players and burners, and Dual Layer 8.5GB disc. Choose audio track and subtitle, include or skip menu are all available for you to set while copy DVD. Only few clicks are all your need to finish the operation and more time saved for copy DVD. An intuitively user interface brings you the comfortable feeling to enjoy.